When grouting, there will always be the risk of grout hazing. That is when your surface is covered in white powdery film created by residual grout that has cured. 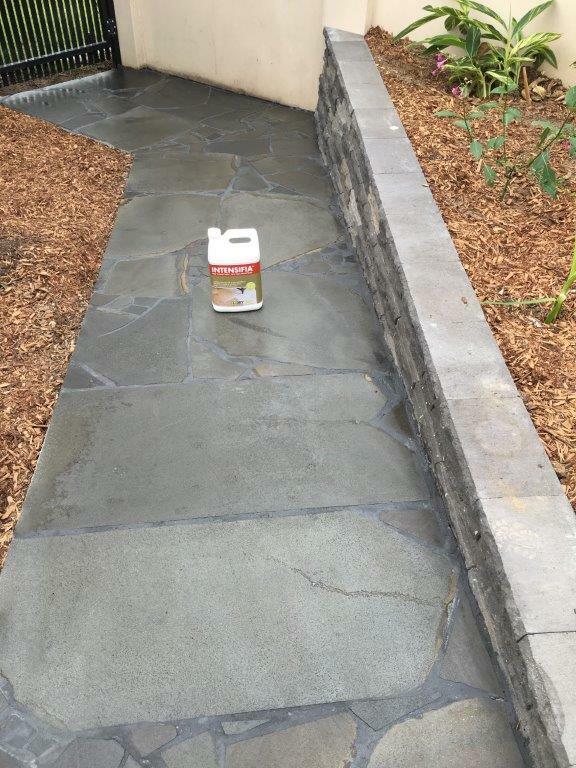 Unfortunately for a homeowner in the Clayfield suburb of Queensland, their beautifully laid walkway suffered from grout haze. They called Johrina from Australia Blue to rectify this problem, as well as to treat their bluestone with color enhancement and protection. 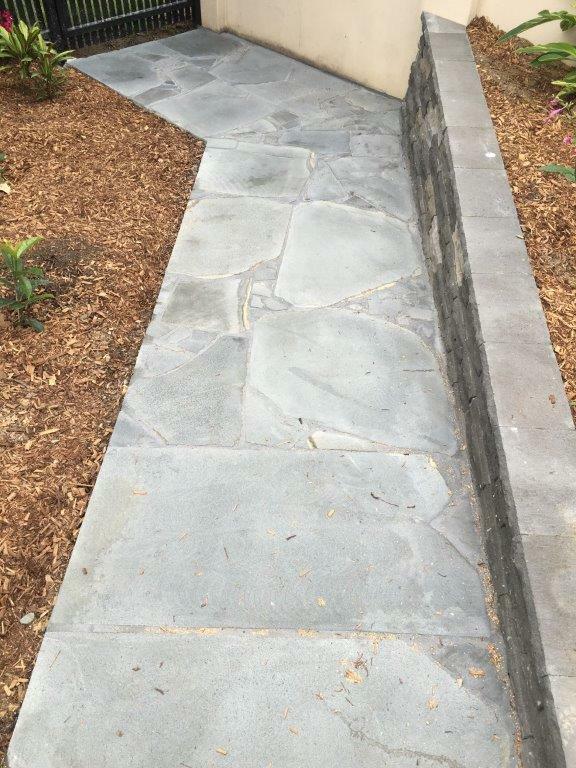 Efflorescence is the white powder-like residue found on the surface of the porous stone. It is caused by water moving through the substrate of a material collecting and carrying minerals and salts found in the mortar bed, grout, soil or the stone itself. When the impure water reaches the surface of a material and evaporates, the minerals and salts are left behind. Through a reaction with carbon dioxide in the air, these form the white marks commonly seen on unprotected porous surfaces. When the efflorescence is fresh, it can be removed using a metal brush or a mild acid. However, the longer efflorescence is left to cure, the more difficult it is to remove. The most effective treatment for efflorescence is prevention rather than removal. Dry-Treat’s STAIN-PROOF Original™ provides premium water and oil repellency. The sealer deeply penetrates into the pores of a material, permanently bonding through a chemical reaction. This creates a water-repelling barrier which stops water ingress. The pores of the material are not blocked so moisture trapped in the substrate can escape as vapor, preventing the salts and minerals reaching the surface. To treat efflorescence use Dry-Treat’s Eff-Erayza™ which is a very powerful acid that is non fuming, non-corrosive to metals (except for uncoated aluminum) and temporary contact does not burn the skin. For more information on efflorescence watch our video. To learn how to apply Eff-Erayza™ watch our demonstration video.